Ukraine accused German Chancellor Angela Merkel and French President Francois Hollande of allegedly stepping up pressure on Kiev to amend the constitution to change the status of parts of the country’s Donetsk and Lugansk regions. "Weary of crises and the influx of refugees, the West is trying to rid itself of at least one flare point and is silently joining with Moscow in a sign of tacit recognition of Russia’s push for global dominion," a German newspaper wrote earlier this month. In an article carried by the August 17 issue of Frankfurter Allgemeine, and aptly titled "A Ukrainian Politician’s Worst Nightmare," Conrad Schuller wrote about the pressure the EU leaders allegedly mounted on Kiev to amend the constitution in favor of the independence-minded regions of Donbass. 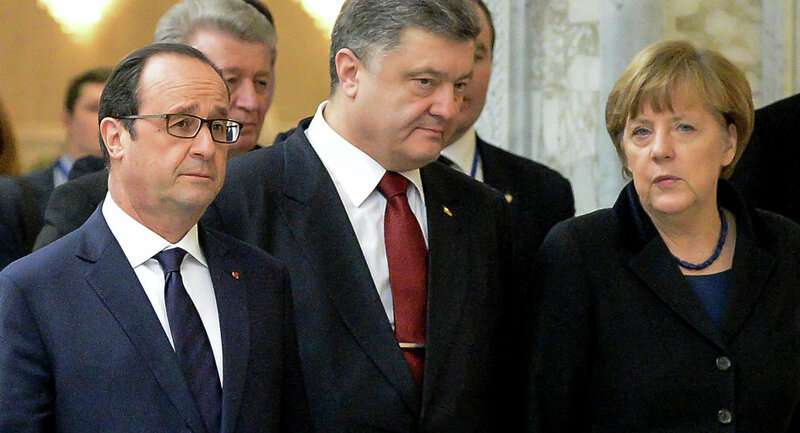 According to Ukrainian parliamentary Vice-Speaker Oksana Syroed, these are exactly the demands Chancellor Merkel and President Hollande made during their August 14 telephone linkup with Ukrainian parliamentary speaker Volodymyr Hroisman. Oksana Syroed said these demands had in mind "Russia’s interests only," while completely ignoring those of the Ukrainian state. When asked by DW to comment on Syroed’s statement, the German government’s press service neither confirmed nor denied the fact of such pressure, saying only that during her conversation with Groisman, Angela Merkel urged Kiev to fully implement the provisions of the Minsk accords, including the proposed decentralization, which is planned for implementation as part of the country’s constitutional reform.